For the municipality in Ontario, see Chatham-Kent. The town developed around Chatham Dockyard and several Army barracks, together with 19th-century forts which provided a defensive shield for the dockyard. The Corps of Royal Engineers is still based in Chatham at Brompton Barracks. The Dockyard closed in 1984, but major naval buildings remain as the focus for a flourishing tourist industry. Following closure, part of the site became a commercial port, other parts were redeveloped for business and residential use, and part became the Chatham Historic Dockyard museum, which features the submarine HMS Ocelot among a good many other attractions. The name Chatham was first recorded as Cetham in 880. The Domesday Book records the place as Ceteham. Most books explain this name as a British root ceto (like Welsh coed) plus Old English ham, thus meaning a forest settlement. The river-valley situation of Chatham is, however, more consistent with cet being an Old English survival of the element catu that was common in Roman-era names and meant 'basin' or 'valley'. Chatham stands on the A2 road along the line of the ancient Celtic route, which was paved by the Romans, and named Watling Street by the Anglo-Saxons. Among finds have been the remains of a Roman cemetery. It long remained a small village on the banks of the river, but by the 16th century warships were being moored at Jillingham water (Gillingham), because of its strategic sheltered location between London and the Continent. It was established as a Royal Dockyard by Queen Elizabeth I in 1568 and most of the dockyard actually lies within Gillingham. Initially a refitting base, it became a shipbuilding yard; from then until the late 19th century, further expansion of the yard took place. In its time, many thousands of men were employed at the dockyard, and many hundreds of vessels were launched there, including HMS Victory which was built there in the 1760s. After World War I many submarines were also built in Chatham Dockyard. In addition to the dockyard itself, defensive fortifications were built to protect it from attack. Upnor Castle had been built in 1567, but had proved ineffectual; the Dutch Raid on the Medway in 1667 showed that more was required. The fortifications, which became more elaborate as the threat of invasion grew, were begun in 1756 as a complex across the neck of the peninsula formed by the bend in the River Medway, and included Fort Amherst. The threat of a land-based attack from the south during the 19th century led to the construction of even more forts. The second phase of fort-building (1806–1819) included Fort Pitt (later used as a hospital and the site of the first Army Medical School). The 1859 Royal Commission on the Defence of the United Kingdom ordered, inter alia, a third outer ring of forts: these included Fort Luton, Fort Bridgewood, and Fort Borstal. These fortifications all required military personnel to man them and Army barracks to house those men. These included Kitchener Barracks (c 1750–1780), the Royal Marine Barracks (c 1780), Brompton Artillery Barracks (1806) and Melville Barracks (opened 1820 as a Naval hospital, RM barracks from 1905). H.M.S. Collingwood and H.M.S. Pembroke were both naval barracks. In response to the huge manpower needs, the village of Chatham and other nearby villages and towns grew commensurately. Trams, and later buses, linked those places to bring in the workforce. The area between the High Street and Luton village illustrates part of that growth, with its many streets of Victorian terraces. The importance of Chatham dockyard gradually declined as Britain's naval resources were reduced or moved to other locations, and eventually, in 1984, it was closed completely. The dockyard buildings were preserved as the historic site Chatham Historic Dockyard (operated by Chatham Historic Dockyard Trust), which was under consideration as a World Heritage Site the site is being used for other purposes. Part of the St Mary's Island section is now used as a marina, and the remainder is being developed for housing, commercial and other uses, branded as "Chatham Maritime". Chatham lost its independence as a borough under the Local Government Act 1972, by which, on 1 April 1974, it became part of the Borough of Medway, a non-metropolitan district of the county of Kent; under subsequent renaming the Borough became the Borough of Rochester-upon-Medway (1979); and, from 1982, the City of Rochester-upon-Medway. 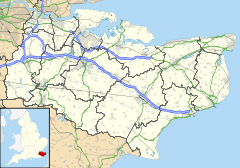 Under the most recent change, in 1998, and with the addition of the Borough of Gillingham, the Borough of Medway became a unitary authority area, administratively separate from Kent. It remains part of the county of Kent for ceremonial purposes. Medway Council has recently relocated its main administration building to Gun Wharf, the site of the earliest part of the Dockyard, a former Lloyd's office building. Chatham is currently part of the parliamentary constituency of Chatham and Aylesford. Prior to 1997, Chatham had been included in the constituencies of Mid Kent, Rochester and Chatham and Chatham. The A2 road at Luton Arches. The New Road runs underneath the Luton Arches Footbridge. Sir John Hawkins Flyover, which was demolished in 2009. Chatham is situated where the lower part of the dip slope of the North Downs meets the River Medway which at this point is flowing in a south-north direction. This gives the right bank, where the town stands, considerable advantages from the point of view of river use. Compared with opposite bank, the river is fast-flowing and deep; the illustration (1), an early print of the settlement, is taken from the point where Fort Pitt now stands. The town lies below at river level, curving round to occupy a south-easterly trending valley (The Brook"), in which lies the High Street. Beyond the dockyard was marshy land, now called St Mary’s Island, and has several new developments of housing estates. The New Road crosses the scene below the vantage point of the illustration. Illustration (2) is taken from the opposite side of the valley: the Pentagon Centre is to the right, with the building on the ridge left of centre, Fort Pitt and Rochester lies beyond that ridge; and Frindsbury is on the rising ground in the right distance. Until the start of the 20th century, most of the south part of the borough was entirely rural, with a number of farms and large tracts of woodland. The beginning of what is now Walderslade was when a speculative builder began to build the core of the village in Walderslade Bottoms. Chatham became a market town in its own right in the 19th century, and a municipal borough in 1890. By 1831 its population had reached more than 16,000. By 1961 it had reached 48,800. The closure of the Dockyard has had the effect of changing the employment statistics of the town. About 7000 people lost their jobs. The unemployment rate went up to 23.5%. There has been a concerted effort to revitalise the Thames Gateway area and one of the largest employers in Chatham is now Vanquis Bank Ltd, a subsidiary of Provident Financial. The Chatham Naval Memorial commemorates the 18,500 officers, ranks and ratings of the Royal Navy who were lost or buried at sea in the two world wars. It stands on the Great Lines, the escarpment ridge between Chatham and Gillingham. The Grade II listed building Chatham Town Hall was built in 1900; it stands in the Brook, and is of a unique architectural design. With the town being part of Medway conurbation, it took on a new role as an arts centre. In 1996, it became the Brook Theatre. The Pentagon Centre stands in the town centre and serviced the old bus station that was closed in 2011. Chatham Waterfront bus station opened in October 2011, replacing the town's previous Pentagon bus station which was built in the 1970s and was considered an unwelcoming environment for passengers. The Medway, apart from Chatham Dockyard, has always had an important role in communication: historically it provided a means for the transport of goods to and from the interior of Kent. Stone, timber and iron from the Weald for shipbuilding and agricultural produce were among the cargoes. Sun Pier in Chatham was one of many such along the river. By 1740, barges of forty tons could navigate as far upstream as Tonbridge. Today its use is confined to tourist traffic; apart from the marina, there are many yacht moorings on the river itself. Chatham's position on the road network began with the building of the Roman road (Watling Street, which passed through the town. Turnpike trusts were established locally, so that the length from Chatham to Canterbury was turnpiked in 1730; and the Chatham to Maidstone road (now the A230) was also turnpiked before 1750. The High Street was bypassed in 1769, by the New Road (see illustration (1)) leading from the top of Star Hill Rochester, to the bottom of Chatham Hill at Luton Arches. This also became inadequate for the London cross-channel traffic and the Medway Towns Bypass, the M2 motorway, was constructed to divert through traffic south of the Medway Towns. Chatham is the hub of the Medway Towns. This fact means that the existing road system has always proved inadequate for the amount of traffic it has to handle, and various schemes have been tried to alleviate the congestion. The High Street itself is traffic-free, so all traffic has to skirt around it. The basic west-east routes are The Brook to the north and New Road to the south, but the additional problems caused by the situation of the Pentagon Bus Station meant that conflicting traffic flows were the result. In the 1980s the Chatham town centre was remodelled and an inner ring road – a one-way system – was constructed. This was completed with the construction of the Sir John Hawkins Flyover opened in 1989 carrying the south to north traffic over the High Street. In September 2006, the one-way system was abandoned and two-way traffic reintroduced on most of the ring-road system. Further work on the road system commenced early in 2009, and as of early 2010, the demolition of the Sir John Hawkins Flyover has been completed. It was replaced by a street-level, buses only, road coupled with repositioning of the bus station. The new Waterfront bus station opened in October 2011. Chatham railway station, opened in 1858, serves both the North Kent and the Chatham Main Lines, and is the interchange between the two lines. It lies in the valley between the Fort Pitt and the Chatham Tunnels. There are three trains an hour to London Victoria, two trains an hour to London Charing Cross and two High Speed trains an hour to St Pancras International. The former services run to Dover and Ramsgate; the Charing Cross services terminate at Gillingham and the High Speed services terminate at Faversham. Part of the industrial railway in what is now Chatham Historic Dockyard is still in operation, run by the North Kent Industrial Locomotive Society. Buses are operated by Arriva Southern Counties and Nu-Venture to various destinations. They serve other towns in Medway including Gillingham, Grain, Strood and Rochester and also to other towns in Kent including Maidstone, Gravesend, Blue Bell Hill and Sittingbourne. There is also an express bus via Strood and Rochester and A2 to Bluewater Shopping Centre in Greenhithe. In the 19th century the ecclesiastical parish of Chatham included Luton and Brompton and also Chatham Intra (land on the river that was administered by the City of Rochester). Chatham's parish church, St Marys, which stood on Dock Road, was rebuilt in 1788. St John's was a Waterloo church built in 1821 by Robert Smirke, and restructured in 1869 by Gordon Macdonald Hills; it ceased being an active church in 1964, and is currently used as an art project. St Paul's New Road was built in 1854; declared redundant in 1974, it has been demolished. St Peter's Troy Town was built in 1860. Christchurch Luton was built in 1843, replaced in 1884. The Royal Dockyard church (1806) was declared redundant in 1981. St Michael's is a Roman Catholic church, that was built in 1863. There is a Unitarian Chapel built in 1861. Chatham is reputed to be the home of the first Baptist chapel in north Kent, the Zion Baptist Chapel in Clover Street. The first known pastor was Edward Morecock who settled there in the 1660s. During Cromwell's time Morecock had been a sea-captain and had been injured in battle. His knowledge of the River Medway is reputed to have preserved him from persecution in the reign of King Charles II. There was a second Baptist chapel founded about 1700. The Ebenezer Chapel dates back to 1662. Chatham Memorial Synagogue was built by Simon Magnus in 1867 on the Chatham end of Rochester High Street in Rochester. The town's Association Football club, Chatham Town F.C., plays in the Southern Counties East Football League, as do Lordswood F.C. The defunct Chatham Excelsior F.C. were one of the early pioneers of football in Southern England. Football league side Gillingham F.C. are seen to represent Medway as a whole. Holcombe Hockey Club is one of the largest in the country, and are based in Chatham. The men's 1st XI are part of the England Hockey League. Kite Flying is possible, especially power kiting on the Great Lines Heritage Park (between Gillingham and Chatham) and at Capstone Farm Country Park. Skiing is also possible near Capstone Farm Country Park at Capstone Ski Slope and Snowboard Centre. On a cultural level, Chatham gave birth to several movements in literature, art and music. In the period from 1977 until 1982 the Medway Delta Sound emerged. The term was coined as a joke by Chatham born writer painter and musician Billy Childish after Russ Wilkins' Medway based record label, Empire Records, used the phrase "from the Medway Delta". Several Medway Delta bands gained international recognition, including The Milkshakes, The Prisoners (see also James Taylor Quartet) and The Dentists. Out of the Kent Institute of Art & Design (KIAD), now the University for the Creative Arts (UCA) came the band known as Wang Chung. The vocalist and guitarist with Wang Chung, Jeremy Ryder, who is better known as Jack Hues attended KIAD. Also Alan Denman, who was a well established lecturer at KIAD formed the Electronic Town as an urban theatre movement in the Medway Towns in 1984. Alan Denman also helped to form The Medway Poets with Billy Childish, Robert Earl, Bill Lewis, Sexton Ming and Charles Thomson. The Medway Poets used to meet regularly at the Railway Tavern that was known as The York during the period from 1974 to 1985 in Ordnance Street in Chatham. So Chatham has had a strong musical and creative arts heritage that was centred on local groups, many of which were part of KIAD. Charles Thomson and Billy Childish went on to create the artistic movement known as Stuckism in 1999. There was a resurgence in the live music scene in early 2001, with an initial focus on the Tap 'n' Tin venue in Chatham. The spirit of the original greatness of the Medway Delta Sound was revived by music and poetry evenings promoted by David Wise's Urban Fox Press, which also published several books by Medway poets and artists. In 2008. the independent arts organisation Medway Eyes was founded, specialising in music and photography. It had promoted several arts exhibitions and gigs at The Barge in Gillingham (now closed) and The Nags Head in Rochester, but then in 2013 it disbanded. The Medway Poets were formed in 1977 and disbanded in 1982 having performed at major literary festivals and on TV and Radio. They became a major influence to writers in the Medway Towns. From the core of this group the anti conceptual/pro painting movements of Stuckism and Remodernism came into being. Recent Medway artists of note include Kid Harpoon, Crybaby Special and The Monsters, Red Light, Underground Heroes, Tyrannosaurus Alan, Pete Molinari, Lupen Crook, Stuart Turner and Theatre Royal. The term 'chav', research suggests, does not derive from Chatham's name ("Chatham average"), but is derived from the romany word for 'youngster'. Local newspapers for Chatham include Medway News and Medway Standard, both published by Kent Regional News and Media; and the Medway Messenger, published by the KM Group. The town also has free newspapers in the Medway Extra (KM Group) and yourmedway (KOS Media). The local commercial radio station for Chatham is KMFM Medway, owned by the KM Group. Medway is also served by community radio station Radio Sunlightbased in Richmond road between the high street and the River Medway. The area can also receive the county wide stations BBC Radio Kent, Heart and Gold, as well as many radio stations in Essex and Greater London. Charles Dickens lived in the town as a boy, both in 'The Brook, Chatham' and in Ordnance Terrace before Chatham railway station was built just opposite. He subsequently described it as the happiest period of his childhood, and eventually returned to the area in adulthood when he bought a house in nearby Gad's Hill. Medway features in his novels. He then moved to Rochester, a nearby town, also part of the Medway Towns. Dave Whitcombe, twice BDO World Darts Championship Finalist. Chris Smalling, England international footballer, attended Chatham Grammar School for Boys. Andrew Crofts, professional footballer, currently playing for Newport County. Neil Shipperley, professional footballer, formerly of Crystal Palace FC and Wimbledon FC. Lee Minshull, professional footballer, AFC Wimbledon and was born in Chatham. Johnny Armour, professional boxer, British Commonwealth, European and World Boxing Union bantamweight champion was born and resides in Chatham. ^ "Was Catu- really Celtic for battle?" (PDF). proto-english.org. ^ "Fortified Places > Fortresses > Chatham". www.fortified-places.com. ^ Harley, Robert J. (1994). Maidstone and Chatham Tramways. Middleton Press. ISBN 1-873793-40-5. ^ "The Historic Dockyard Chatham – Your Big Day Out in Kent". Chatham Historic Dockyard Trust. ^ "Chatham Naval Dockyard". UNESCO. Retrieved 21 September 2007. ^ Masters, Sam (9 January 2014). "Chatham dockyard's bid for Unesco World Heritage Site status is blocked". The Independent. Retrieved 17 November 2014. ^ "Chatham Maritime" Archived 26 November 2009 at the Wayback Machine article on SEEDA website. Retrieved 25 August 2010. ^ Rochester, The past 2000 years, Published Privately City of Rochester Society 1999. ^ a b Jessup, Frank W. (1966). Kent History Illustrated. Kent County Council. ^ "Can Sandwich learn from the Chatham Dockyard closure?". BBC News. 3 February 2011. Retrieved 26 April 2012. ^ "Former Town Hall and Medway Arts Centre, Chatham". britishlistedbuildings.co.uk. 1 June 1990. Retrieved 26 April 2012. ^ Selby, Jade. "Medway theatres". www.medway.gov.uk. ^ "Pentagon Shopping Centre". Pentagon Shopping Centre. ^ "Chatham two way". BBC. 2006. Retrieved 28 January 2009. ^ "Town flyover demolition next month". Medway Messenger. 2009. Retrieved 28 January 2009. ^ "Chatham Historic Dockyard Railway". Retrieved 22 February 2013. ^ Macadam, Edwin and Sheila. "St John the Divine, Chatham, Kent – CHURCH FOR SALE". www.westgallerychurches.com. ^ "Church transformed into vineyard". BBC News. 25 October 2004. Archived from the original on 8 August 2012. Retrieved 1 April 2010. ^ Rochester, The past 2000 years, (City of Rochester Society) 1999. ^ "The Beautiful History of Club Crests, Club Colours & Nicknames". Retrieved 22 February 2013. ^ "Powerkiting flying spots in and around Kent". Archived from the original on 25 July 2013. Retrieved 22 February 2013. ^ "Capstone Ski Slope and Snowboard Centre". Retrieved 22 February 2013. ^ Thomson, Charles (August 2004), "A Stuckist on Stuckism: Stella Vine", from: Ed. Frank Milner (2004), The Stuckists Punk Victorian, pp. 7–9, National Museums Liverpool, ISBN 1-902700-27-9. Available online at "The Two Starts of Stuckism" and "The Virtual Stuckists" on stuckism.com. ^ "Medway Eyes". wordpress.com. Retrieved 22 April 2018. ^ "Tyrannosaurus Alan". guilfest.co.uk. Retrieved 22 April 2018. ^ "Theatre Royal Rochester, UK". bandcamp.com. Retrieved 22 April 2018. ^ "Savvy Chavvy: social entrepreneurs engage gypsies". The Telegraph. London. 24 July 2008. Retrieved 24 December 2008. ^ Quinion, Michael. "Chav". Retrieved 23 February 2009. ^ ODNB entry: Retrieved 10 March 2011. Subscription required. ^ "Andrew Crofts - Midfielder - First Team - Newport County". www.newport-county.co.uk. Retrieved 18 February 2019. "Chatham (England)" . Encyclopædia Britannica. 6 (11th ed.). 1911.